So, you’ve just met someone and of course one of the first things they did was tell you their name. Now just five minutes later you couldn’t repeat their name if your own life depended on it. You apologize and mumble something about your terrible memory as you ask them to repeat their name. Sound familiar? Well, I have good news and bad news for you. The bad news is that you just told a little white lie there. The good news is that in all likelihood your memory is just fine. You didn’t “forget” their name you never heard it in the first place. Now don’t get to worrying about your hearing cause that’s fine too, you don’t have a hearing problem, what you have is a listening problem. You see, while they were telling you their name you, instead of listening, were thinking of what you were going to say next. You, like lots of lots of other people, didn’t want there to be a pause while you were considering what they said. As they were talking you were preparing to respond. 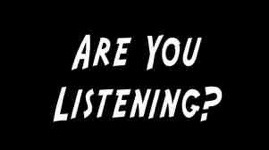 You made the most common listening mistake there is: you listened to respond instead of listening to understand. There is a world of knowledge out there for those that listen well. When we commit to really listen we discover details that make succeeding much faster and often, much easier. Listening is a skill, and like any skill we can improve it through practice. Don’t worry about a little silence as you seek to understand what was said to you before replying, great communicators seek to understand before they seek to be understood. If you’re serious about listening better here is a bit of homework for you: ask three people that know you well what you can do to be a better listener and then do it. Don’t argue, don’t disagree, just do it. If you’ve picked the right three people they will know what you need to do. If you’re really serious about listening better and you are married, make certain that one of those three people is your spouse. The same rules apply, no arguing, just do it. Now, back to remembering names… Oh geez, it looks like we’re out of time. In Friday’s post I’ll share with you a formula that will make remembering names (assuming you really heard them) much easier and even fun. Until then listen up, you’ll never remember what you didn’t hear in the first place. This is a well-known phenomena called the “next in line effect.” That’s the name … I didn’t make that up. It’s not just names we forget. In a group conversation we do this all the time, get wrapped up in what we’re going to say and forget to listen to what’s being said in that minute. We tend to then either repeat what someone else said or comment in ways that do not move the conversation forward. I agree that we need to listen more, but the natural pace of our conversation moves pretty fast. Perhaps in addition to trying to listen more effectively, we might also make an effort to slow down, to get off the bullet train and give ourselves and everyone a chance to truly think. Silence is not the enemy. I don’t do this often enough (and I am admittedly awful with names) but it helps sometimes to repeat the name back, as in “Hi Steve, it’s so nice to meet you. Tell me Steve, what brings you here today.” The problem is not just listening it’s also that while we are in conversation our brains are not processing most of that information and storing it into long term memory. A brief conversation on the other hand allows us to practice the information (the name) and get it stored and properly associated with the face it belongs to. A lot of problems come down to listening to respond instead of listening to understand- thanks for the reminder! This is so true . It happened to me often times in the past . Listening is an important social skill indeed . That’s a great way to describe it, it is indeed a social “skill”.